After we picked up our rental car we left the city and drove south to David Gareja. We went some time hiking through a colorful landscape and spent the night in a homestay in the almost abandoned town Udabno. The family prepared a room for us and we were also served delicious dinner and breakfast. The next day we already crossed the boarder to Armenia which turned out to be very easy and straightforward. The rental company had prepared all the papers for the car and everything worked fine. 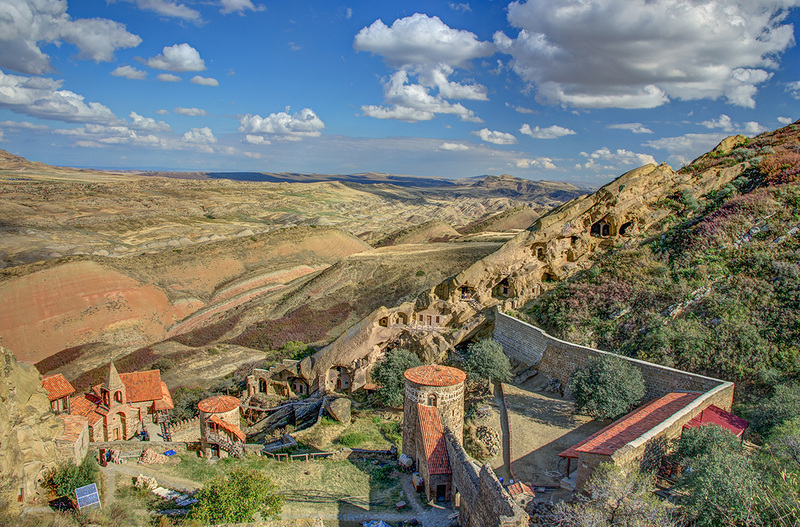 On our way through the scenic Debed Canyon we visited 2 monasteries before we arrived at Alaverdi - an old Soviet industrial town. The friendly owner of our accommodation prepared a great dinner which we enjoyed together at one big table with many other nice travelers. passenger in an Armenian police car with Scooter at full volume. Notice the potholes. We usually started to drive in the morning with no clue what our final destination would be. We always looked for an accommodation in the late afternoon which never was a problem. Seldom have we been to a country with so few tourists in general and never in a country with almost no German tourists. 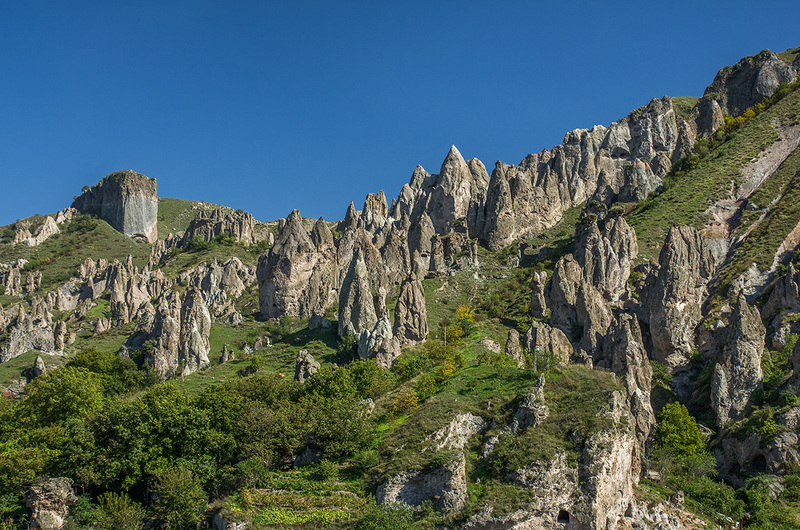 We continued our journey further south to the city of Goris known for its Stone Forest. The landscape around Goris was beautiful and we did some hikes close to Khndzoresk (yes try to pronounce the name of that town...) the next day. 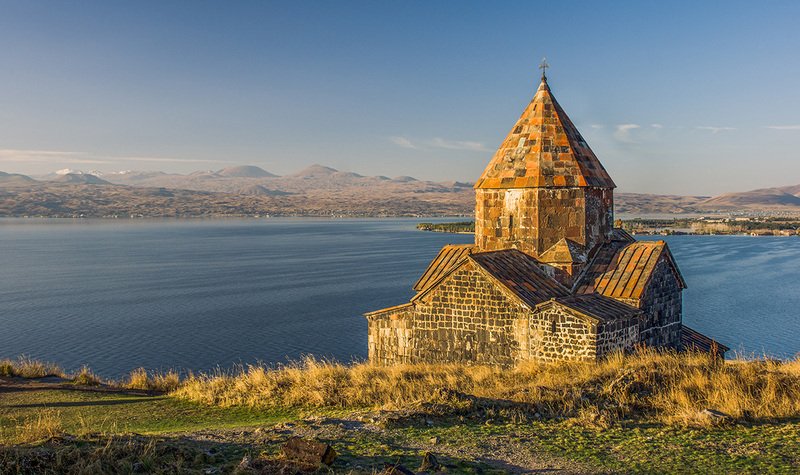 As it turned out the small town of Tatev would be our southernmost point in Armenia. 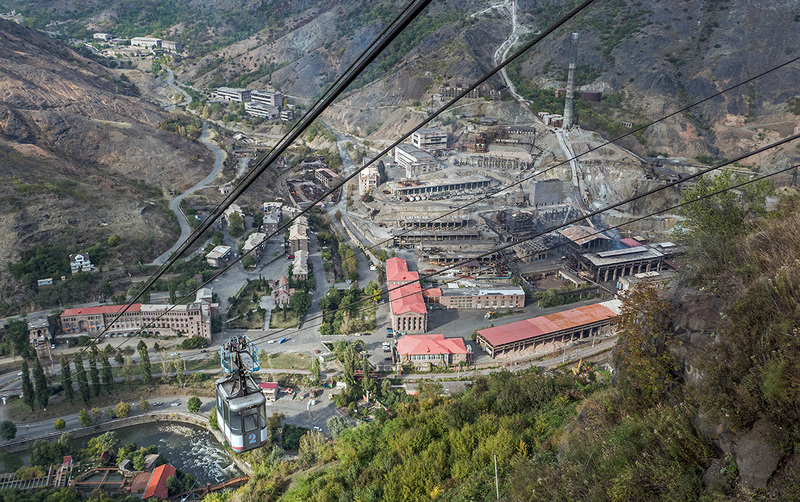 Since some years Tatev is famous for its cable car which is over 5 km long and for its really well restored monastery. We did a nice hike along a rocky ridge and enjoyed the time in the lonely nature - the only person we met that day was one shepherd. 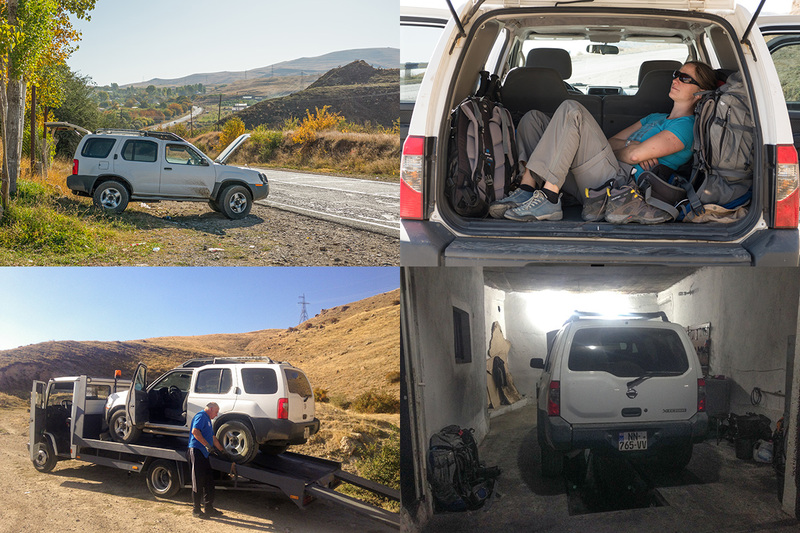 On our way to Jermuk we picked up some Iranian hitchhikers and ended up sharing a rental apartment together with them. When we went out for dinner we accidentally ended up in the middle of a birthday party where we were literally being pulled on the dance-floor and had to shake with the locals. Naturally it would have been impolite to refuse the homemade Cognac which they offered us. It was good that we had a big car so the three Iranian guys and their three huge backpacks also fitted in it. After an amazing breakfast made by Milad we first visited the really nice waterfall of Jermuk. 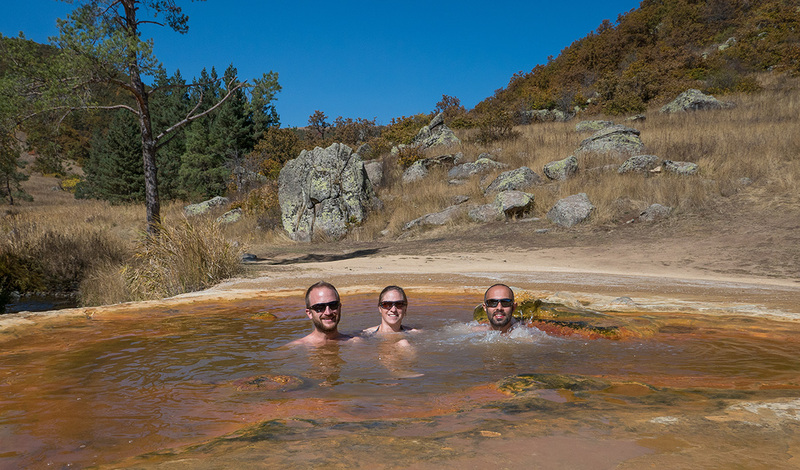 Afterwards we left the town in search for the natural hot springs close by. It took some time till we found the right gravel road. This was the first time that we put our 4x4 to good use and at three quarter of the way we decided that the way was getting to dodgy and too difficult to continue driving so we stopped the car and continued by foot. Time was already running out and we definitely still wanted to do some more hiking. 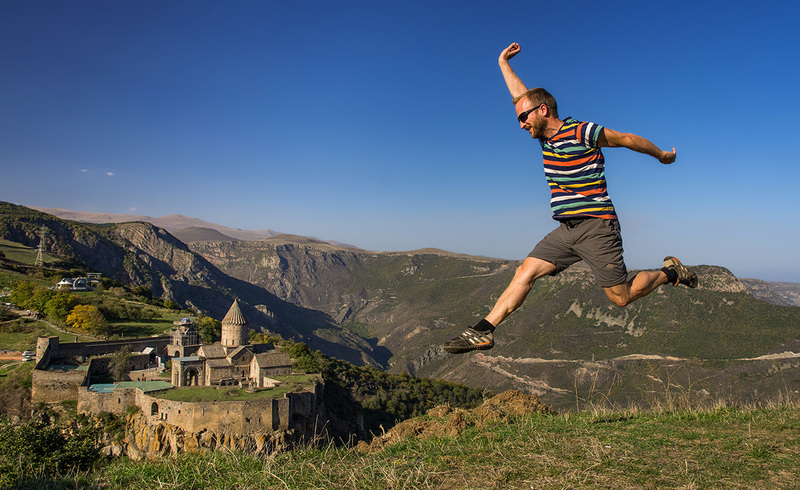 So we decided to drive to Garni and Geghard and start a two-day hike into the mountains from there. It was nice to hike in a totally different landscape than what we are used to from Austria. Although we hiked along a seemingly lonely and small gravel road we met quite many truck drivers crossing the mountains. They really could not understand why we rejected their offer of giving us a free ride and how we preferred to walk instead - this must seem weird to them :-) We also saw some shepherds who where looking after their animals. One of them approached us from very far away and when he finally got to us asked us something in Russian. Sadly we don't speak Russian (yet) but he used his hands and feet and imitated a donkey sound so we understood that he was looking for a donkey - unluckily we had not seen one. After this hike we had to make our way back to Georgia. 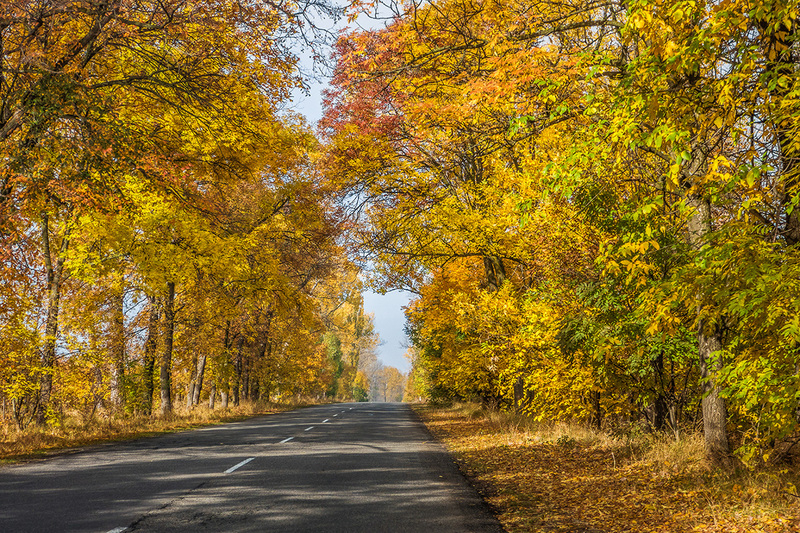 Until this moment we had had two weeks of golden autumn with very nice weather and perfect temperatures. On the last days we got a little bit of rain and grayish weather which even was a welcome change after two weeks of almost no clouds at all. We drove for two days until we reached the crazy traffic of Tbilisi again. Driving on our own in this city was definitely the craziest and most challenging traffic we ever had and we were totally exhausted when we finally arrived our accommodation in the evening. The next day our wonderful road-trip through Armenia and a small southern part of Georgia sadly was over. 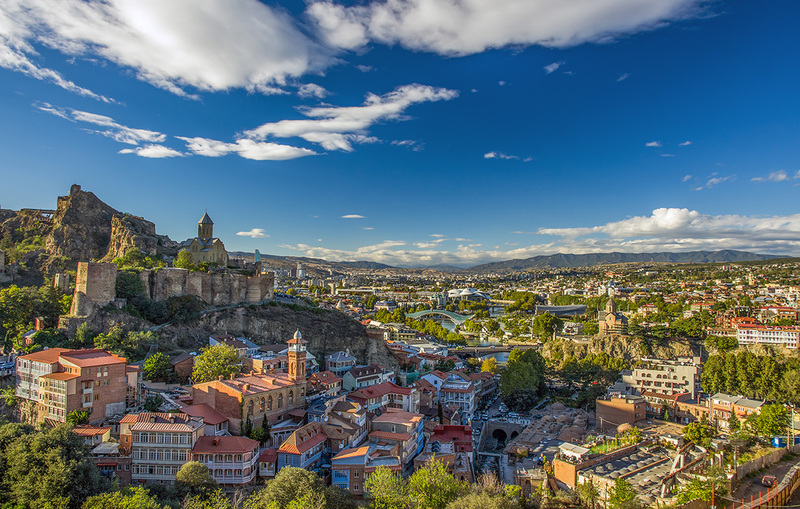 of all the trips we have done it was by far the cheapest transportation to get from the airport to the city center of Tbilisi - the public bus which runs every 30 minutes around the clock costs less than 0,25 US Dollars. 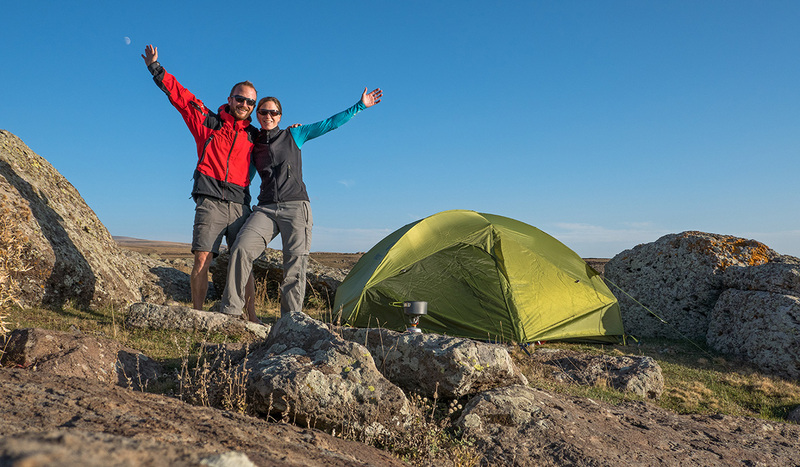 while we enjoyed the freedom of being able to go everywhere anytime with a rental car we also have to say that we felt some disadvantages; mainly that with a rental car we felt much more disconnected and further away from the local people. hitch hiking in Armenia is very common. Many locals use it as normal means of transportation. We picked up many locals and also some tourists.